I have only read one of his books (The Danger Within AKA Death in Captivity) which has convinced me to try more, and I have a few on my bookshelves. I was surprised, I have three that you mentioned above. Looking forward to them. A treat in store . . . Death in Captivity was such a good idea. Gilbert was in a prisoner-of-war camp himself. I didn’t know he’d written quite that much! I really enjoy his books, Smallbone & Close Quarters particularly. And of course Night of the Twelfth, which you put me onto recently – a real humdinger, and one I keep thinking about since I finished it. He is such a good story-teller. I know you’d love The Black Seraphim. I really enjoyed Smallbone Deceased, which I read years ago. Black Seraphim sounds like my kind of mystery so I’ll look out for it. I do think you’d like it, Lyn. There are lots of cheap second-hand copies around and it’s also available as an ebook. I just reserved Smallbone at the Toronto Public Library. There’s only 1 copy in circulation — and 2 reserves ahead of me. Coincidence? I am quite surprised that there is even one, given how old it is. I have a ancient paperback and will be embarking on it again soon. 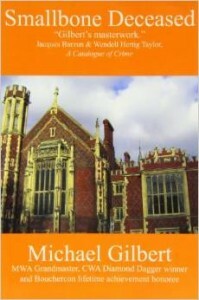 I’m a lifelong fan of Gilbert, and share your love of his writing. Thanks for mentioning The Crack in the Teacup, one of his most under-rated books. I was lucky enough to talk to him and also to correspond with him. He was, as one might guess from his writing, charming, decent, and generous. Lovely to hear from you, Martin. That is just how I would have expected him to be and it is heartening when that is the case. Just reread The Crack in the Teacup: who would have thought that local government and planning regulations could be so fascinating? That was a mark of his skill, wasn’t it? I read it long before becoming a solicitor, and at least he didn’t put me off! It must be nice to read a book where a lawyer is the hero! Absolutely, and perhaps it was a background inspiration for the emergence of Harry Devlin many years later!